On Friday, with the US on the verge of another government shutdown and debt ceiling breach (with the agreement reached only after the midnight hour, literally) Moody's warned Trump that he should prepare for a downgrade from the rating agency that refused to join S&P in downgrading the US back in August 2011. The reason: Trump's - and the Republicans and Democrats - aggressive fiscal policies which will sink the US even deeper into crippling debt while widening the budget deficit, resulting in "meaningful fiscal deterioration." In short: a US downgrade due to Trumponomics appears inevitable. And incidentally, with Friday's 2-year debt ceiling extension, it means that once total US debt resets - unburdened by the debt ceiling - it will be at or just shy of $21 trillion. 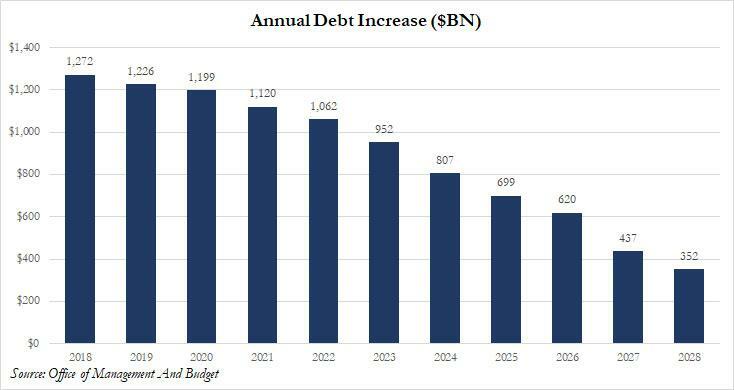 Now, following today's release of the White House budget proposal from the Office of the Management and Budget, Moody's will have even greater motivation to downgrade the US as according to the forecast, total US debt is projected to rise from $20.5 trillion today to an unprecedented $29.9 trillion in 2028. 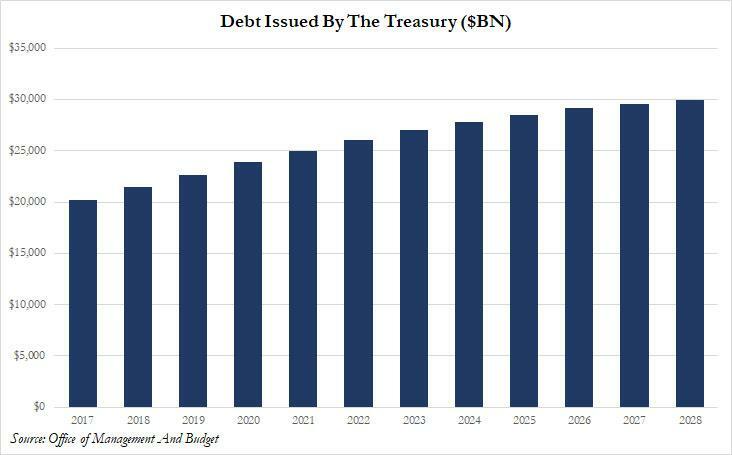 As the next chart shows, the Trump deficit, which is surely on the optimistic side with its projections, anticipates total US debt rising by over $1 trillion for the next 5 years, until 2022, then gradually declining to only $352BN annual increase in 2028. The good news, as noted earlier, is that Trump’s proposal, which calls for higher spending on military and immigration enforcement and abandons the GOP goal of balancing the budget over decade, is expected to be ignored by Congress. What is unknown is what alternative Congress will come up with, and how much higher the 2028 debt total will end up being. For now the 10Y does not appear especially concerned, although with a debt-busting recession guaranteed in the next 10 years, it is a virtual certainty that the total debt number in 10 years will be substantially higher than what is projected above.